'Productivity' at work and the expansion of mental illness designations; Institutional racism and Māori mental health; Crime and mental illness in Aotearoa New Zealand; Developmental psychology and the surveillance of school children. Cohen, B. M. Z. (in print) ‘A Postcolonial Critique of Mental Health’, in Moodley, R. and Lee, E. (Eds) Routledge International Handbook of Race, Ethnicity, and Culture in Mental Health. Abingdon: Routledge. Cohen, B. M. Z. (2018) 'Introduction: The Importance of Critical Approaches to Mental Health and Illness', in Cohen, B. M. Z. (Ed.) Routledge International Handbook of Critical Mental Health. Abingdon: Routledge, 1-12. Cohen, B. M. Z. (2018) 'Marxist Theory', in Cohen, B. M. Z. (Ed.) 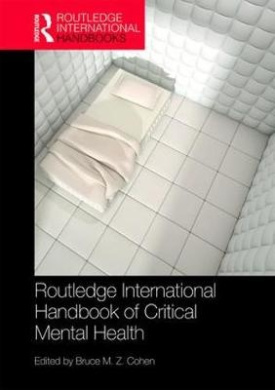 Routledge International Handbook of Critical Mental Health. Abingdon: Routledge, 46-55. Cohen, B. M. Z. (Ed.) (2018) Routledge International Handbook of Critical Mental Health. Abingdon: Routledge. Cohen, B. M. Z. (2016) 'The Psychiatric Hegemon and the Limits of Resistance', Philosophy, Psychiatry, & Psychology, 23(3/4): 301-303. Cohen, B. M. Z. (2016) Psychiatric Hegemony: A Marxist Theory of Mental Illness. London: Palgrave Macmillan. Cohen, B. M. Z. (2016) ‘Psychiatry Under the Influence: Institutional Corruption, Social Injury, and Prescriptions for Reform’, Psychosis: Psychological, Social and Integrative Approaches, 8(4): 372-373. Cohen, B. M. Z. and Tseris, E. (2016) ‘Indigenous and Ethnic Minorities: New Zealand’, in Boslaugh S (ed.) Encyclopedia of Pharmacology and Society. Thousand Oaks: Sage, 774-777. Tseris, E. and Cohen, B. M. Z. (2016) ‘Cosmetic Pharmacology’, in Boslaugh S (ed.) Encyclopedia of Pharmacology and Society. Thousand Oaks: Sage, 420-423. Cohen, B. M. Z. and Allison, W. (2015) ‘Pills, Thrills and Bellyaches: The effects of criminalising a ‘legal high’ in Aotearoa New Zealand’, New Zealand Sociology, 30(1): 10-29. Despite the continued lack of scientific evidence to justify psychiatric knowledge, categories of mental illness have proliferated over the past thirty years with terms such as ‘bipolar’, ‘ADHD’ and ‘autism’ now common in public discourse and often worn as badges of honour by those labelled as such. How do we understand these changing attitudes towards mental illness and the increasing power of psychiatric knowledge today? This research investigates our growing passion for mental illness, articulating it as the success of a Psychiatric Hegemony in neoliberal times – that is, our willingness to consume capitalist ideology under the guise of psychiatric expertise. Drawing on the research evidence and utilising a Marxist approach, this work profiles the decline of the social state and an increased focus on the individual from the 1980s onwards, suggesting that there has been an increased need for the informal control of populations beyond institutional borders through the expansion of milder forms of mental illness and the encouragement of mental health self-regulation. Thus, the research is a return to critical theory in which the available research evidence is framed within the structures and processes of late capitalism; something that has been missing from much of scholarly work within the sociology of mental health since the 1980s. Cohen B M Z (2015) Mental Health User Narratives: New perspectives on Illness and Recovery, revised edition. Houndmills, Basingstoke: Palgrave Macmillan. Cohen B M Z (2014) ‘Emil Kraepelin’, in Scull A (ed.) Cultural Sociology of Mental Illness: An A-to-Z Guide. Thousand Oaks: Sage, 440-442. Cohen B M Z (2014) ‘Mental Health and ‘Emotional Deviance’’, in Atkinson R (ed.) Shades of Deviance: A Primer on Crime, Deviance and Social Harm. Abingdon: Routledge, 190-192. Cohen, B. M. Z. (2014) ‘Mental Illness (Joan Busfield) [review]’, Journal of Sociology, 50(4): 628-629. Cohen B M Z (2014) ‘Passive-Aggressive: Māori Resistance and the Continuance of Colonial Psychiatry in Aotearoa New Zealand’, Disability and the Global South, 1(2): 319-339. Cohen B M Z (2014) ‘Routledge Handbook of Critical Criminology (Walter S. Dekeseredy and Molly Dragiewicz) [review]’, Australian & New Zealand Journal of Criminology, 47(2): 299-301. Cohen B M Z and Tseris E (2014) ‘Psychiatric Social Work’, in Scull A (ed.) Cultural Sociology of Mental Illness: An A-to-Z Guide. Thousand Oaks: Sage, 687-691. I expect doctoral students in sociology to investigate their chosen topic in a systematic, challenging and critical manner drawing on relevant social theory. Postgraduate study, especially a doctoral programme of study, can be highly challenging at the same time as being rewarding. My philosophy on supervision is simple: I am here for guidance, advice and signposting; generally making sure the student has as smooth a ride as possible in completing their work to a high standard. In return, I expect students to be autonomous and highly motivated. They need to be prepared to put in the hours, complete work on time, and demonstrate a high level of analytical and critical thinking in their writing. Cohen, B. (2016). Psychiatric Hegemony A Marxist Theory of Mental Illness. Springer. Pages: 241. Cohen, B. M. Z., & Allison, W. (2015). Pills, thrills and bellyaches: The effects of criminalising a ‘legal high’ in Aotearoa New Zealand. New Zealand Sociology, 30 (1), 10-29. Cohen, B. M. (2014). Emil Kraepelin. In A. Scull (Ed.) Cultural Sociology of Mental Illness: An A-to-Z Guide. Thousand Oaks, California: SAGE. Cohen, B. M. (2013). Psychiatric Hegemony: A Marxist view on social constructionism. In F. Davies, L. Gonzalez (Eds.) Madness, Women and the Power of Art. Oxford, UK: Inter-Disciplinary Press. Related URL. Cohen, B. M. (2013). The Power of Madness: A Marxist critique of social constructionism. Beyond these walls: confronting madness in society, literature and art. Oxford: Inter-Disciplinary.Net.